The shape of the building lot resulted in a beveled chamfer and multifaceted pitched roof. Sir Peter Warren was born in 1703 to an esteemed Irish family that was considered “in the pale” – or highly favored by the British. By the time he was 14 years old he was taken into the British Navy and at the age of 20 was a full captain with his first command. 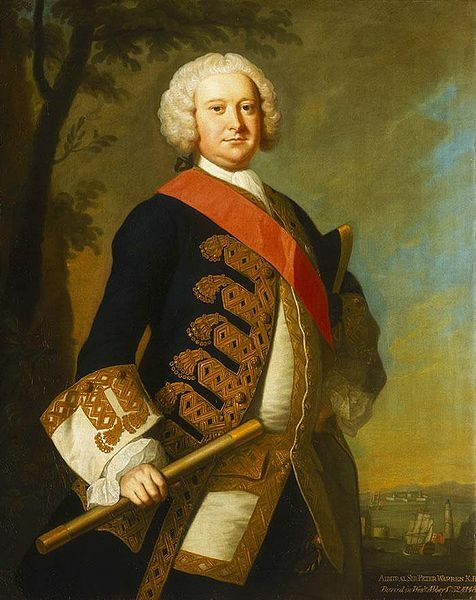 Although Warren would become a British vice admiral, Knight of the Bath, Member of Parliament and would be buried in Westminster Abbey; it was his life in colonial New York City that is most often remembered. Like most wealthy and key British officers, Warren would need a summer estate. North of the city in the open rolling fields outside of the tiny village of Greenwich, Warren acquired nearly 300 acres. In recognition of his role in the Seige of Louisbourg, the city considerably increased his holdings. Warren died in July of 1752. 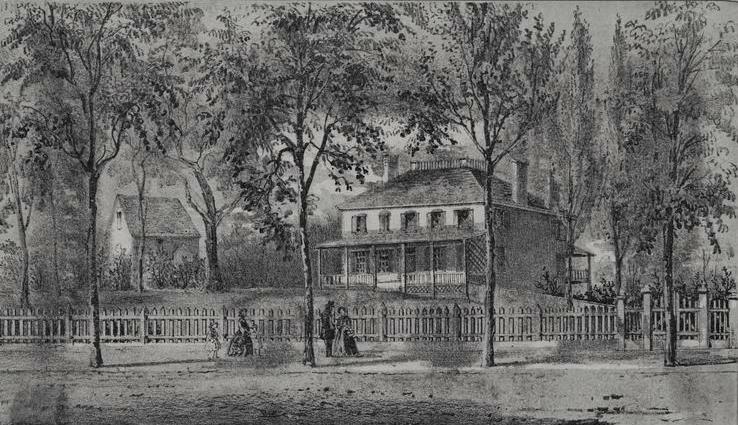 Wealthy merchant Abijah Hammond purchased the estate and, around 1819, the mansion was sold to Abraham van Nest. Slowly, as with all the sprawling 18th century country seats, Warren’s former estate was swallowed up by the city. The yellow fever epidemic of 1822 and 1823 in the crowded city forced New Yorkers who could afford to do so to flee to Greenwich Village; resulting in a flurry of building. The former Warren property was plotted and sold and little by little the grand mansion was surrounded by streets and homes. It was finally demolished in 1865. 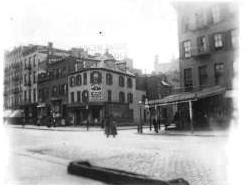 A local carpenter-builder purchased the plot at the corner of Hudson and Charles Streets in 1826. Here he built a somewhat peculiar brick home on the oddly-shaped lot. The Flemish-bond red brick was highlighted by paneled brownstone lintels over the windows and paired dormers punched through the steep roof on both sides. To deal with the problem of the irregular site and to increase usable interior space; the builder created a delightful beveled chamfer, one bay wide. Whether the original design included shop space on the first floor is unclear; however by 1850 Daniel E. Lane ran his mercantile business here. 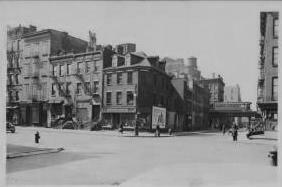 By now the neighborhood was clearly developed and Hudson Street was lined with similar businesses. Flemish-bond brickwork and paneled lintels were extra touches. Not long after Beach’s endorsement, although certainly unrelated to it, the pharmacy became I. B. Meyer’s drugstore. On June 19, 1902 Dr. Wolf Tulschinsky took over the pharmacy, moving his business from a store at Canal and Orchard Streets. No. 533 was painted white in 1903 while Meyer's drugstore was still here. Below the third-story window on the corner, a metal sign advertises Sovereign Cigarettes -- photo NYPL Collection. In the second half of the 20th century Greenwich Village became the epicenter of New York's gay culture. Around 1968 the former drugstore became home to Sazarac House, a Creole restaurant with a primarily gay clientele. Like the Beach Pharmacy, the little restaurant, locally famous for its jambalaya, would become a mainstay for Village residents—remaining on the corner spot for three decades. Brownstone lintels hovering over tiny windows and modern bricks divulge renovations. Now home to an ale house, the building’s two sets of paired dormers were joined sometime in the middle of the last century. Close inspection of the brickwork reveals other minor alterations where windows have been added or removed. Yet nearly two centuries after its construction, the peculiar-shaped Federal building survives. Many thanks to Keith Taillon for suggesting this post. Non-credited photographs taken by the author. Mr Miller -- Enjoyed your blog. Would like to correct the name of the father of Adm Sir Peter Warren's wife. He was Etienne (Stephen) DeLancey -- who built the building known now as the Frauncis Tavern on Pearl Street. thanks for catching that. corrected! CORRECTION: There was never a coffee house in 533 in the sixties. I and a friend were its occupants from 1965 to 1968, when it became the Sazerac House, a gay bar. When we took occupancy in 1965, 533 Hudson (we also occupied the basement apartment on Charles Street that was connected to 533 Hudson via an interior courtyard) the premise was an abandonded carpenter's workshop (I still have some of his tools, wood, and hardware) purportedly the business of a Mr. Bayard, carpenter who died there.